We love any reason to celebrate! Whether it’s a holiday, a birthday, anniversary or just another Tuesday, Monkey Cat is here to provide the best food & drink for any celebration. Holidays are always a super busy time for us. The week leading up to a holiday, as well as a few days after, are always busy. 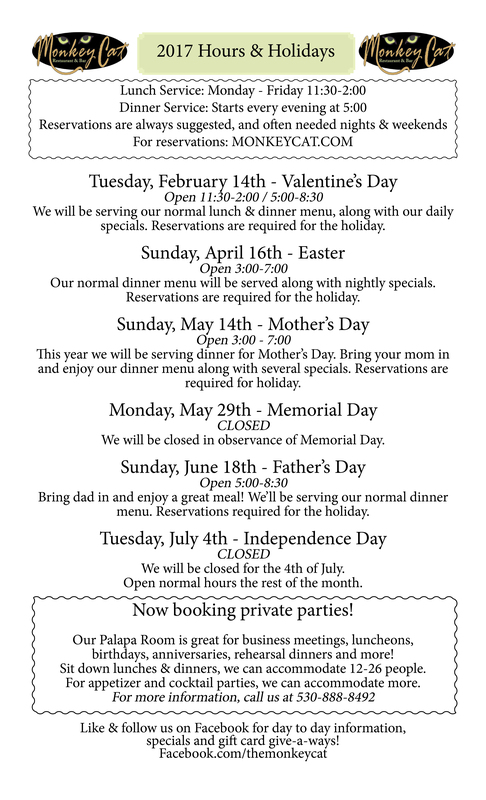 We want to make sure everyone can take advantage of celebrating holidays. The best way to do that is to make reservations. We always tell our customers that weeks before a holiday is the best time to make reservations. If you wait until the week of, the day before, or the day of, there’s very little chance you’ll get a table. You can easily book a table by visiting our homepage and clicking the “Make Reservations” tab. We do all of our online reservations via OpenTable. Please make sure to leave the correct phone number & email when making reservations. For big holiday’s we do confirmation calls for reservations. You must respond to our confirmation calls in order to keep your table. Listed below are our hours for part of 2017. We will update again after July with the end of year Holidays. Thank you for choosing Monkey Cat for your holiday destination. If you ever have any questions, concerns, or comments, please give us a call at 530-888-8492 and we will assist you the best that we can! All of us here are looking forward to a wonderful year, and we can’t wait to share it with you! No Replies to "Holidays at Monkey Cat"